Spray 3 to 4-quart slow cooker with nonstick cooking spray. Place pork ribs, onion and garlic in sprayed slow cooker. Cover; cook on Low setting for 8 to 9 hours. About 5 minutes before serving, remove ribs from slow cooker; place on serving platter and cover to keep warm. In 2-cup microwave-safe measuring cup, combine all sauce ingredients; mix well. Stir in 3/4 cup juices from slow cooker; discard remaining juices. Microwave sauce on High for 2 to 2 1/2 minutes or until mixture boils and thickens, stirring once halfway through cooking. Pour sauce over ribs. Country-style ribs are loin-cut ribs that are meatier than spareribs and are available with or without bones. 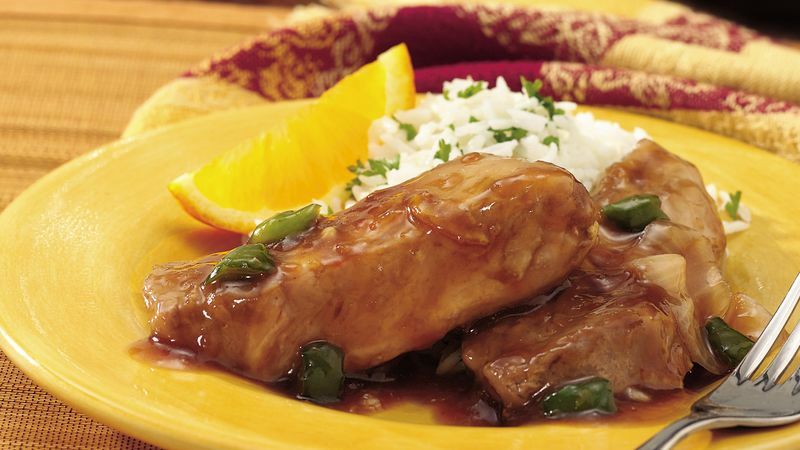 Boneless ribs fit nicely into slow cookers. One-half teaspoon of ground ginger can be used in place of the grated gingerroot.